The last we heard about Wes Craven's slasher film franchise sequel Scream 4 was disparaging news for fans of the horror series. Series writer Kevin Williamson was off the project, Craven wasn't in control of the script, and much of the cast wasn't happy with re-writes from Ehren Kruger. But despite all these problems, the production has pushed forward and is moving right through principal photography. Although some spy photos have made their way online from people checking out shooting in Michigan, today Craven gave us a first look (see below via Twitter) at the return of Ghostface, the serial killer who's back for Sidney Prescott. Scream 4 is currently scheduled for release on April 15th next year. You can follow Craven on Twitter here. Honestly, it's not as if this is a groundbreaking first look since the masked killer hasn't changed his look at all. Craven could've easily snagged a picture from any of the previous productions with just the killer in the photo and we wouldn't be any the wiser. Also, in case you don't remember, the original voice of Ghostface, Roger L. Jackson, will reprise his vocal role in the sequel as well. In addition, Jackson is joined by franchise survivors Neve Campbell, Courtney Cox and David Arquette. New cast members include Hayden Panetierre, Alison Brie, Mary McDonnell, Emma Roberts, Adam Brody, Marley Shelton and Erik Knudsen. 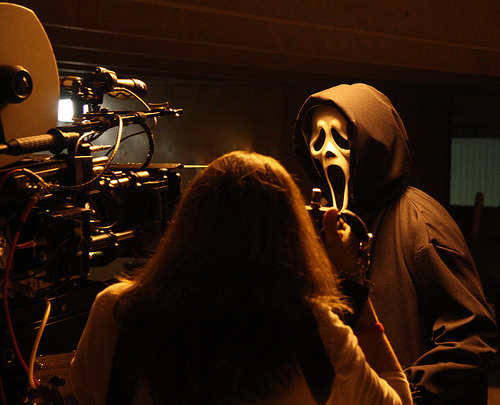 Screenplay problems or not, I'm looking forward to seeing how Ghostface will dispatch with all of these new victims. Sidney should be the killer that would be awesome. After all the crap that has happened to her she just went nuts and became the killer. It won't happen but it would be quite cool to see her go completely bonkers. Xerxex - It's not "meh". Migh be "meh" after I've seen it. But untill then I'm gonne hope for the best. It has the original creative team and original cast. So even if it turns out bad, it's still a pretty cool project I think... But Wes Craven is genrerally a bad director -- even though he seems like the nicest man. I thought they would've went with a different approach with the costume this time around, not meant to sound bad, but not necessarily great either. At least the original cast is back, eh? #7. They were to post-modern to begin with to be afraid of them. I mean, the first one had the working title "scary movie". So it's not really about being afraid, more about getting a few jump-scares and being entertained. The first one had a really entertaining cast (Expect straightfaced Neve) with nice dialouge. But it went downhill because Sidneys story wasn't that entertaining to begin with, it had nothing to build on. It was sort of redundant even in the first film, they could have got rid of it and played with Billy/Stu not really having a motif. But still. Hopefully this will be atleast as good as part 2, then it will be a success in my book. It seems like they keep trying to "leak" these extremely lackluster images of the Ghostface killer in the hopes that we'll completely forget the huge red flags that went up just a few weeks ago - THE ORIGINAL SCREENWRITER, KEVIN WILLIAMSON, IS OFF THE PROJECT! THE CAST IS UNHAPPY AND IN SOME CASES DROPPING OUT DUE TO THE SCRIPT CHANGES OCCURRING SINCE HE LEFT! WES CRAVEN HAS NO CONTROL OVER WHAT HAPPENS TO THE STORY! You can show me a string of pics of Ghostface, Neve Campbell, Courtney Cox, whatever, but until I hear something about what they're doing to salvage the STORY, I can only assume these are just pictures of a train wreck of a movie. It's just a whole lot of flash and misdirection. The sad thing is that it will probably work too. If M. Night's Airbender can earn as much as it has being as poor of a film as it is, surely a franchise as beloved as Scream can do the same, right Dimension? yeah, it's really sad that they didn't go into production with a solid script. Scriptchanges during filming never looks good imo. @Ryderup I'm going with "Meh" until a trailer, after the second one I was left really disappointed, so perhaps once a trailer comes out I'll tell you what I really think! After the Wassup scene from Scary Movie, how can anyone take that mask seriously anymore? that is true Hattori, that scene bascially too the creepy factor away. That scene and the "She sees him on the football field, Ghostface then quickly runs away before she turns back to gaze from the window again before assuming she was seeing things" scene.